The participants of Eurasian Week Forum taking place in Yerevan (Armenia) believe that it is crucial for the Member States of the Eurasian Economic Union (EAEU) to synchronize joint digital policy to achieve maximum effect from its use in the economy. Integration shall become an advantage heading toward the quantum leap in the Union’s industry development. During the second day of the Eurasian Week Forum and Expo the plenary meeting “Technological Breakthrough and Potential Opportunities of the EAEU Countries” was held. The event organized by the public organization “International Forum of Eurasian Partnership” and the Ministry of Industry and Trade of the Russian Federation with the assistance of the Eurasian Economic Commission (EEC) and the Government of the Republic of Armenia became one of the central points of the forum, as the strategic benchmark for the entire Union is still the use of maximum opportunities provided by innovative economy sector. New breakthrough technologies are currently the strongest factor supporting competitive ability of the EAEU economy, wherefore authorities and businesses must working in close cooperation resolve the issues of development and creation of high-tech goods and services both for their own use within the Union’s space and for their promotion at the global markets. The central challenge of the meeting became the cooperative potential of businesses and support of import substitution in high-tech EAEU sectors. Developing Eurasian export-oriented brands in the Eurasian Economic Union and implementing the Digital Agenda will serve the basis of technological breakthrough of the Union countries. Such opinion was expressed by the Chairman of the Board of the Eurasian Economic Commission (EEC) Tigran Sargsyan. He mentioned that technological breakthrough and competition in this sphere was the direction through which not only modernization of the Union countries’ economies but the entire transformation of the society might be accomplished. “Digitalization, “Industry 4.0” concept change not only economy but also our lifestyle pattern. Such deep technological transformations are associated with new challenges and threats parallel to them and which to our belief may be best eliminated through joint efforts, – stated the Chairman of the EEC Board. –Creation of regional associations is an opportunity, on the one part, to face such challenges and, on the other part, - to identify potential of the uniting countries”. Regionalization is a global trend. We won’t succeed separately. The world is quickly changing under the influence of technological progress. It becomes smaller and smaller. To make people feel comfortable in such an environment harmonization of EAEU countries’ legislation and development of the appropriate “road map” are required, said with confidence Tigran Sargsyan. The Chairman of the EEC Board urged the business community of the Union countries to take part in the project of Russian industrial area in Egypt. He added that the EEC negotiated with Egypt to create a free trade area (FTA). During the recent meeting, an agreement was reached with the President of Egypt on holding the EAEU – Egypt business forum. “We are now engaged in an interesting discussion on commodity groups, for which we plan to reduce the customs tariff. It is necessary to understand in this negotiation process, which directions are seen by our businesses as the priority directions to enter the Egyptian market”, – reported Tigran Sargsyan. According to the Chairman of the Coordination Committee of the third International Forum of Eurasian Partnership, the UNESCO Goodwill Ambassador Ara Abrahamyan, a good many problems have accumulated in the world today on the path to economic development, and the Eurasian space does not constitute an exception here. “I am sure that the economy and stable policies unite much more than any other endeavors. We now see the dynamics of the EAEU internal market growth and at the same time understand that the potential has not been exhausted yet. Moreover, the potential goes far beyond the existent level. 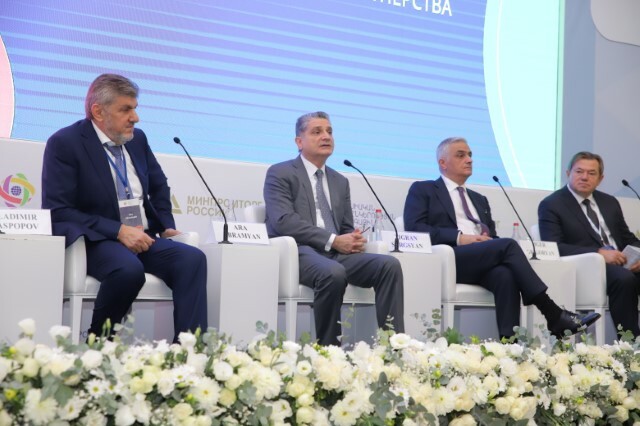 It is the understanding of these things that attracted the representatives of businesses from a number of countries not part of the EAEU to the today’s forum”, – believes Ara Abrahamyan. “To begin with, we need to create conditions enabling appearance and constant reappearance of the EAEU businesses’ motivation for development by way of introduction of new technological solutions. The second thing is a demand for consolidation of efforts, it is a complex and rather expensive sector, and therefore, we won’t get the maximum effect without consolidation. And the third thing is distribution of developments inside the Union and at its expense the use of new products to the benefit of all market players”, – such proposals were made by the Vice Prime Minister of the Republic of Armenia Mger Grigoryan. Creation of free trade areas with other states is a very important aspect, emphasized the Deputy Minister of Industry and Trade of the Russian Federation Georgy Kalamanov. “We signed within the framework of the EAEU an agreement with Vietnam, an interim agreement with Iran. Also at this point, I would like to mention the role of Armenia that has the only land border with Iran, because creation of a special area at the border is also a crucial aspect upon promotion of this agreement. In the near future, we are to initiate negotiations with Egypt. Based on the arrangements of the Russian Federation with this country I reckon that the EAEU States’ participation in the implementation of Egyptian projects will be of great significance. This includes creation of the Russian industrial area and different production facilities in Egypt in conjunction with the other Union countries. We will now start negotiating with Israel, with other countries. I hope that using joint efforts we will be able to promote our products abroad”, – told the Deputy Minister of Industry and Trade of the Russian Federation. The Minister of Economy of the Kyrgyz Republic Oleg Pankratov mentioned in his address that the issue of both economic and humanitarian cooperation was pending. “I want to mention the need for enhancement of interaction and integration in the sphere of education, because today’s education shall be seen not only as humanitarian but also as an economic component. A great problem is non-availability of labour resources able to satisfy the market demand for advancement of new technologies. Collaborative work, exchange of experience, information, creation of common educational centers would enable all the countries to expedite the finding of their place at the global market in the sphere of new technologies”, – believes the Minister of Economy of the Kyrgyz Republic. To become successful at the common market one shall use the entire range of tools supporting innovative development, the advisor to the President of the Russian Federation, Sergey Glazyev reckons. We need common development institutions, which would form the pathway for development of cooperation in prospective directions, the special-purpose programs. “The time has come to entrust to the EEC considerable financial resources to form special-purpose programs. For this purpose we could use experience of the European Union”, – summarized the advisor to the Russian President. The advisor to the US President on cyber security matters, the Chairman of the Board of Giuliani Partners, ex-Mayor of New York City, Rudolph Giuliani mentioned not only the advantages but also the risks for businesses due to development of digital technologies and their distribution on a worldwide basis. They include stealing money from banks and companies, embezzlement of important company-wide information, damage to electronic systems. “All the countries are interested in the use of cyber technologies but we shall also think about protection from cyber risks, because the number of net-crimes is soaring. At the same time, there is no any universal solution to make the cyber space fully secure but if the countries act in concert, they will reach the goals they cannot reach alone. If any of the States invents a new cyber security technology, why not share it with the others? I am sure, if we are able to collaborate in this sphere not being afraid to become more vulnerable, we will on the contrary be more secure”, – stressed Rudolph Giuliani.